Abstract: The swiss cheese appearance of the horizontally mounted cooling fins will give anyone cause for pause, but the central copper core should reassure you that this heatsink is built for one reason. The only place I have ever seen this heatsink prior to receiving it for testing is on Akiba. The Kuthtec KTM2101 employs a design which is entirely unique - there simply isn't anything like it being made by any other heatsink manufacturer anywhere. The swiss cheese appearance of the horizontally mounted cooling fins will give anyone cause for pause, but the central copper core should reassure you that this heatsink is built for one reason, and only one reason. Cooling performance of this heatsink is better than we expected, but with nothing similar to compare it to we were really just guessing. 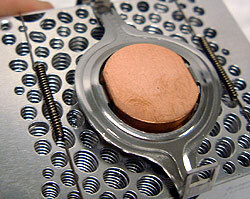 Kuthtec use the same type of copper core as we have seen on the KTM3000, but with a little twist. The top of the copper core is hollow. Since the processor core makes direct contact with the copper, in theory the transfer of heat energy to the surrounding aluminum fins should be more efficient, but we'll have to see for ourselves how this odd-looking heatsink really performs. Fan Specs: Superred, ~4800RPM, 12V, 0.28A. The KTM2101 is based around a central copper core to which punched out sheets of 1mm thick aluminum are attached. While this might not sound too revolutionary in itself, it is the pattern which has been punched out of the fins that really makes these types of heatsink standout. Kuthtec call it a "multi-channel wind tunnel", but to me it looks like swiss cheese. The entire heatsink is made up of 22 such panels, and each and every one of them are filled with dozens of various sized ovals and circles in a radial pattern around the center. I have to admit, this is one of the first times where I'm at a loss to explain the principles behind this cooling, so we'll be basing our opinions on thermal performance. 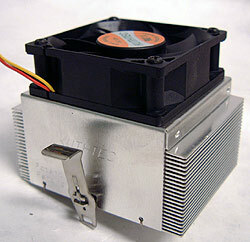 List all Kuthtec heat sinks that Frostytech tested?